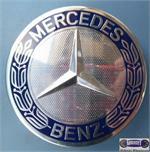 65261, CENTER CAP, USED, 02-05, MERCEDES, C CLASS, CHROME EDGE, NAVY BLUE OUTER RING, CHROME WORD MERCEDES BENZ, RAISED CHROME LOGO, 3" DIA. 85146/65261, CENTER CAP USED, 11-13, MERCEDES, C CLASS, E350 E550, CHROME EDGE, NAVY BLUE, ROUGH CENTER, 3" DIA., ORDER UNDER 65261 CENTER CAP. 85384, CENTER CAP USED , 15-16, MERCEDES BENZ, GLA CLASS, NAVY BLUE & CHROME, TEXTURED CENTER, RAISED LOGO, PLASTIC CLIPS, 2-7/8" DIA.